Ten years ago, on September 20, 2002 a cult phenomenon began. Is it time for a TV movie? Writer and director Joss Whedon created the American space western television series Firefly. Set in the year 2517, after the arrival of humans in a new star system, it follows the adventures of the mercenary crew of Serenity, a "Firefly-class" spaceship. Whedon described the show as "nine people looking into the blackness of space and seeing nine different things." 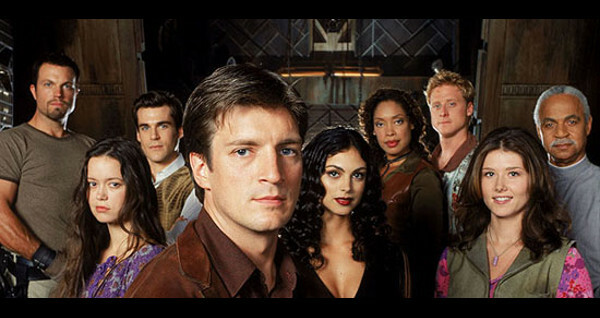 It starred Nathan Fillion (Malcolm Reynolds), Summer Glau (River Tam), Morena Baccarin (Inara Serra), Adam Baldwin (Jayne Cobb), Jewel Staite (Kaylee Frye). Science Channel is shooting a new one-hour reunion special chronicling the Firefly cast at Comic-Con this week. It'll feature interviews with the cast and the creator Joss Whedon taking the viewer behind the scenes of the show. But, I say we go all the way. We know there's never going to be another movie in the theaters. Serenity was a brilliant, but singular event. The television series will probably never come back. Especially since Nathan Fillion (Captain Mal) is on the successful show Castle. But what about a TV movie? What if they could bring the crew back for one shiny trip into the black? Would you watch it? What would it be about? Should it be the original cast? Where would they go? Your turn. Let us know in the comments and the best ones will be added to the post next week. Would you watch be a Firefly TV movie? Should they aim to misbehave? Never watched Firefly or Serenity so I don't really care one way or the other. Pat, I know you hear this a lot, but you ready have to watch an episode. Just one. Or the movie. Fan of both series and movie. When the movie came out I hoped it would jump start a return for the show. Now though I've had enough time to think it through and I think it should stay as it is. Part of the fantastic dynamic of the show was the interplay between Shepherd and the various members of the crew as well as the relationship between Wash and Mal. While they tended to downplay them in the movie, that was a good part of the show. Without them I just don't see a TV movie doing any favors. Misbehave!! Best series ever cancelled. Although TS is right - we're minus two crew members now and it just wouldn't be the same without Wash. Can't wait to see the reunion special. Hell yes, I would watch another movie. Mal and crew should have at least one more cinematic adventure. Heck Yes Too... if I were Joss, I would walk in and show them the last paying gig he had and smile with all the zeroes. I am so torn on this one. On the one hand, hells yes I'd watch. I mean, FIREFLY! And on the other hand, how could I watch it without Wash? It would be just too sad. It's seriously really hard to answer. In the end though, if it's Whedon, I'm watching. Hell, yes!! The cats raise their paws. The husband unit wants to see it, too. Good lawd! Has it been 10 years?!?! Yeesh. Of course, I'd watch it. I'd pay the price of admission...twice! With Whedon's recent huge success, they could get a movie out of it. I imagine they'd add a few more characters, as they tried to in the last one. Ad as I've said before, hopefully focus a lot more, and more directly, on River Tam. If Joss and the original cast was involved....ABSOLUTELY! I'm so out of it, I never watched it but I wish I did. Does that buy me any geek points? No? Darn.